Will Marvel’s new space adventure travel light-years ahead of the competition? Peter Quill, A.K.A. 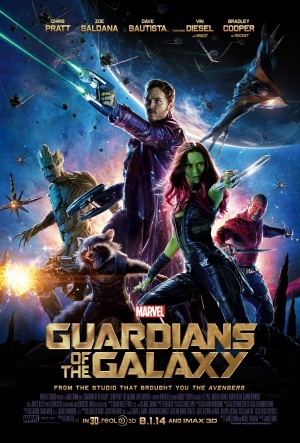 Star Lord, teams up with a group of space outlaws to claim a reward worth travelling the galaxy for, but they soon realise there’s more at stake than a whole heap of money. The film starts off with a sad background story on our lead outlaw, Quill, before he leaves Earth for good, and for the good of the film. Like Thor, which spent a lot of time away from earth, the rest of Guardians explores new planets, races, and technologies and makes a refreshing change as not many sci-fi blockbusters have treated us to such lavish worlds in recent years. The cool space technology and weapons make this stand out against the other Marvel mammoths as well, and work as a well-implemented vessel for some fantastic visual effects. Marvel has never been shy of throwing in the odd joke or two, but they really take it to the next level here. While it’s not full blown slapstick there’s a very light-hearted atmosphere with enough humour to keep the viewer entertained, and some genuine laugh out loud moments. If you’re after caring and close to the heart characters, then it’s probably worth leaving this alone; too much is invested in comedy for it to really commit to any meaningful sentiment, but it does try. That doesn’t mean that it’s discredited for this, it just doesn’t entirely pull off some of the touching moments after it’s pretty much taken the mick out of all serious emotion for ninety minutes previous. A team of misfits fighting to become heroes and led by an underdog isn’t a new concept, but it’s the individuals that make this team worth watching, and importantly worth rooting for. Drax is the muscular warrior of the group but it’s pretty funny to see him break his initial perception with a vast vocabulary and high intelligence, even if he doesn’t understand metaphors – “Nothing goes over my head. My reflexes are too fast.” Despite this, Rocket Racoon steals the show, and was always likely to as a foul-mouthed, carefree raccoon. With all of these combined and the conflict between them it seems they all have a reason to hate/kill each other at first and it’s obvious this great misfit team is just getting started. How refreshing. It’s great to have a film by the Marvel gang that doesn’t revolve around a couple of guys in tights and masks destroying things. It’s more of a fun Sci-Fi packed treat that’s come at exactly the right time for the humongous studio. Definitely one to get on!